Take One Make One (TOMO) is designed to teach safe hunting practices to students who have no previous outdoor hunting experience. This program will increase their awareness and the value of wildlife and the natural environment by encouraging experienced adults to "pass on" traditional outdoor skills. TOMO emphasizes teaching safe and ethical hunting, the conservation and responsible use of our natural resources and character education. TOMO allows youth to experience the shooting sports and the outdoors through mobile education trailers using video simulators and hands-on air rifle ranges. 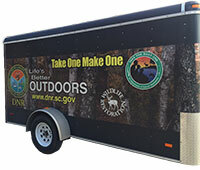 These education trailers travel throughout the state to local events and festivals and serve as a recruitment tool for the program. 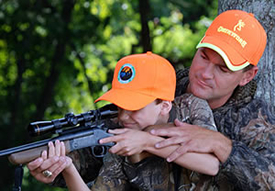 TOMO provides a specific mechanism for students ages 10 through 18 to learn about safe and ethical hunting through first-time youth hunts. Participants will be paired with experienced hunters who sponsor and actively participate in TOMO’s hunting mentorship program. The Take One Make One brochure is available in the Adobe PDF file format. Adobe® Reader® is required to open the above file and is available as a free download from the Adobe® Web site.